LatterDayBride and Prom presents perhaps the most impressive collection of modest wedding dresses that we've seen on the Internet. The company website displays many pages of modest gowns with short sleeves, long sleeves, Queen Anne necklines, and scoop necklines. The collection is vast, and many of the dresses are very stylish and elegant, with up-to-date fabrics and embellishments. Visit the site and you'll see ruched bodices, ballgown skirts, a-line taffeta gowns, asymmetrical skirts, mermaid skirts, and many options with beads. The acronym "LDS" that is used on the company website refers to modesty standards that are promoted by The Church of Jesus Christ of Latter-day Saints. Though not officially affiliated with the church, LatterDayBride seeks to offer attractive and conservative gowns for women who adhere to the faith, as well as others who desire fashionable and modest options. The company also sells temple dresses. 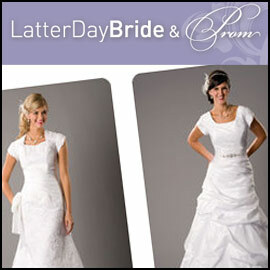 LatterDayBride and Prom is based in Salt Lake City, Utah.